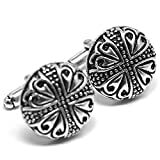 From England, UK, this fabulous set of Viking’s Men Cufflinks, makes the perfect gift or accessory for any occasion! Sold by MESE London, this high end pair of cufflinks will impress everyone, turning your night into a success! Durable and lightweight, this one of a kind set of shirt cuffs is sure to deliver confidence and make you stand out! DO NOT MISS THIS INCREDIBLE OPPORTUNITY, as this fabulous piece of jewellery comes in a FREE ELEGANT GIFT BOX, making it ideal as a gift, for that special someone! So if you were waiting for the perfect moment to seize the opportunity, the time is now! CLICK ‘ADD TO CART’ for FREE & FAST delivery!